If you’re looking for a more sophisticated option for April Fool’s Day, I’ve got you covered! Rather than serving your guests toothpaste-filled oreo cookies, why not bring out giant gemstones for dessert instead? It’s a win all around! An old Inuit legend about labradorite says that long ago, the Northern Lights fell from the sky and become trapped inside some rocks off the coast of Labrador. The sky remained dark and these shimmering rocks sat undisturbed until a warrior came upon them and was transfixed by their beauty. He tried to set these magnificent lights free by striking the rocks with his spear. Most of the lights escaped and returned to their sky home, but some remained permanently imprisoned within the rocks, illuminating their grayness with ephemeral dancing light. 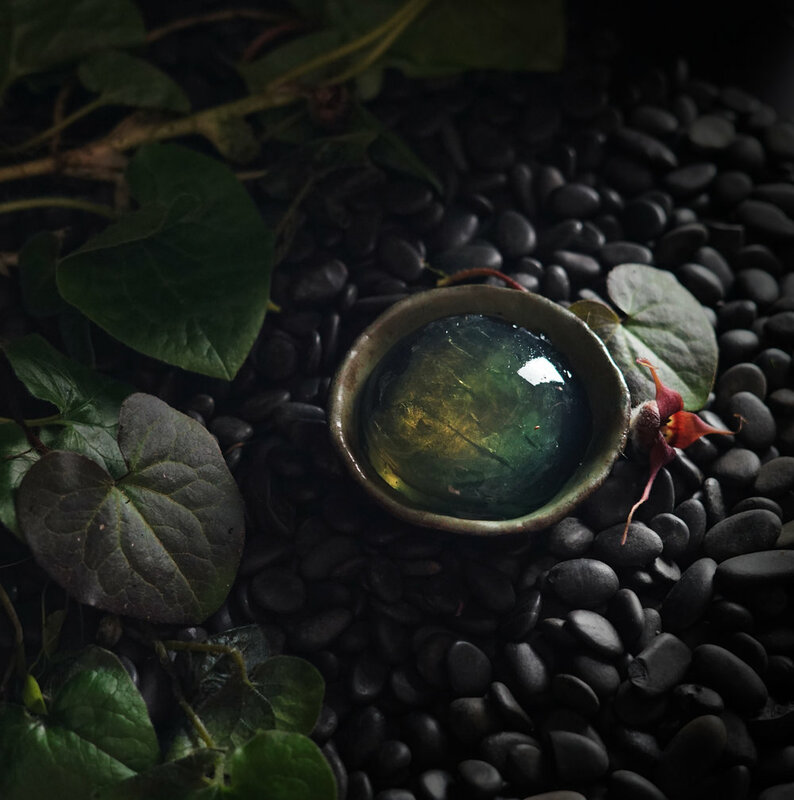 According to this legend, that is what gives the stone labradorite its bright shimmers of blue and green. Labradorite speaks of the sea, of underwater mysteries and treasures glimmering far beneath the surface. It is a stone of mysterious beauty, so stunning you can almost taste it. That was the inspiration for this dessert. I asked myself “if labradorite was a food, what would it taste like?” The answer came to me: it would taste like something dark and mysterious, indicative of dark forests or the shimmering depths of the ocean. It would be something herbaceous and refreshing, like glimmering water. It would taste like wild ginger. 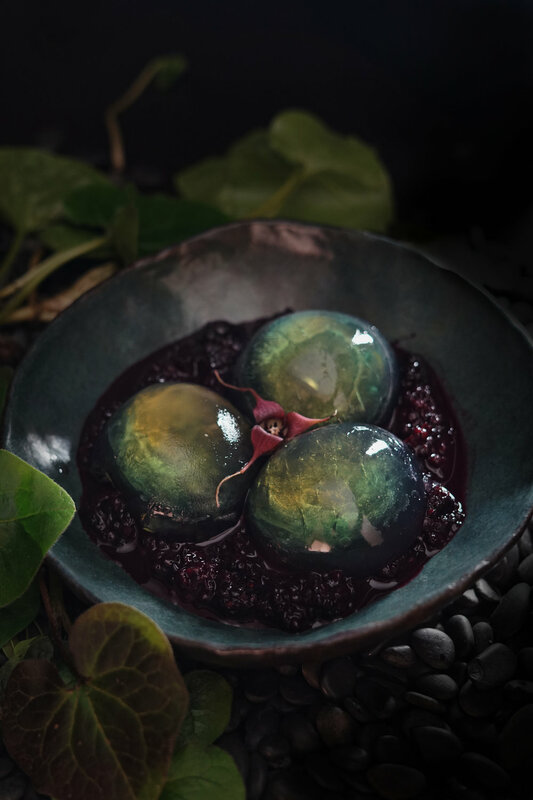 This gelatin-based dessert shimmers with the beauty of trapped sunlight, northern lights, bioluminescence. It’s served with a sauce of juicy blackberries, as dark as the night sky or the depths of the sea. It is delicate and fresh, making it the perfect spring dessert. Wild ginger has a much more gentle flavor than ginger root, plus a refreshing citrus undertone. It pairs beautifully with green tea to make a simple and stunning dessert. 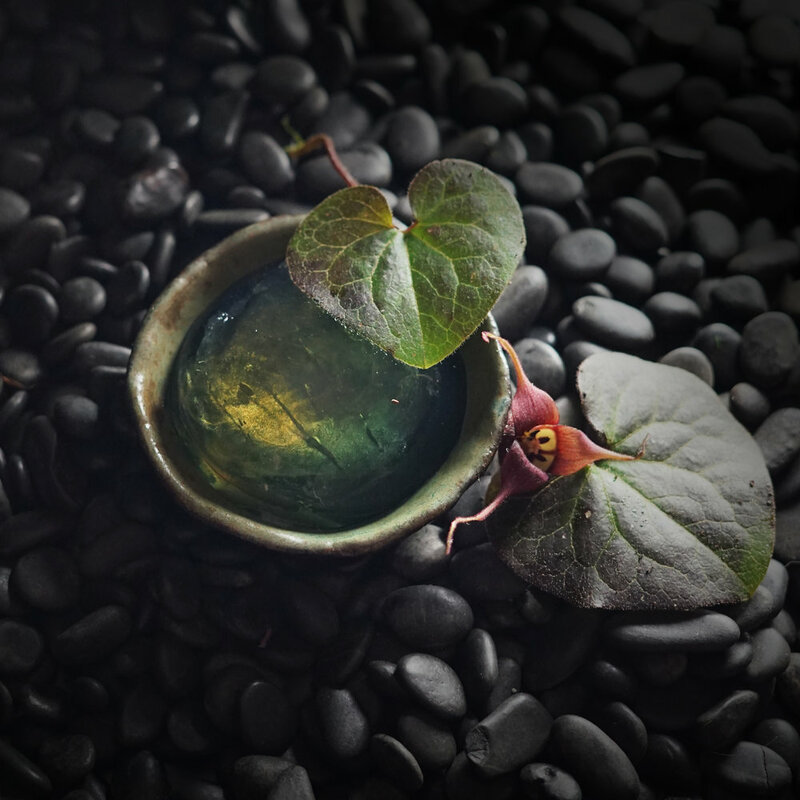 *A note on wild ginger (asarum caudatum): Both of the wild ginger plants that grow in the Pacific Northwest (the other being asarum canadense) contain small amounts of aristolochic acid, which is a toxin and carcinogen. Consumed in high amounts, studies have shown that it can cause serious kidney problems. But here’s the thing: aristolochic acid is barely soluble in water (less than 1%), which perhaps explains why most of the Indigenous uses were as a tea, where the plant matter itself was discarded. There’s a very small amount of wild ginger in this dessert, which is split into several servings. It’s also only steeped in water. I certainly wouldn’t recommend you go out and eat a salad of wild ginger greens (nor should you steep them in alcohol or vinegar), but in my opinion this recipe presents a safe, very low dose. Do keep in mind that everyone’s reactions to wild plants is different, though, and eat at your own risk. You can learn more about wild ginger here. Put the 1 Tbs. of water in a small bowl. Sprinkle the gelatin on top and let bloom. Heat up the remaining water and put the green tea and wild ginger in it. Let steep 5 minutes, then strain and stir in the sugar and gelatin until well dissolved. Pour into molds (about 1/2” thick) and chill until set up. Start the tea steeping earlier this time; heat up the water and put in the green tea, wild ginger, and butterfly pea flowers. Let steep for a few hours. Strain. Put 2 Tbs of the tea into a small dish and sprinkle the gelatin over the top. Heat up 1 c. of tea and then mix in the sugar and gelatin. Let cool a little bit. Using a small, sharp knife, cut a few incisions through the luster layer. This makes the gem more life-like. Then pour another thin layer of mixture #2 on top gently so as not to disturb the luster and let chill for another 5-10 minutes. Cook in a medium saucepan for 20-25 minutes over medium-low until the berries have softened and the mixture has thickened. Let cool and chill.